"PMSL' is often spelled all uppercase, but can also be spelled 'pmsl'. All versions mean the same thing. This peculiar acronym expression is very much a United Kingdom expression, however, it is the same as 'rofl' or 'lmao' in American English. (second user:) ROFL @ Jim! Bwahahahaha!. (third user:) PMSL! Never put anything in your mouth when Greg is telling stories about his camping trips! The spawning of this expression from the United Kingdom is unclear. There are instances of the PMSL acronym being used online since the year 2000. Web etymologists have described the PMSL expression as being originally used in small online communities that practice 'leetspeak' and the creative swapping of letters with numbers. The PMSL expression gained popularity with European soccer fan sites as footballers would recount comedic incidents at their football matches, or when the opposing team would suffer some kind of indignity or funny defeat. The only difference between using PMSL or the American equivalents of ROFL/LOL/LMAO is a matter of cultural flavor. You would use PMSL if you think that your readers are largely from the UK or other parts of the Commonwealth that speak non-American English. You would use ROFL or LOL or LMAO when you expect your readers to be from the Americas. 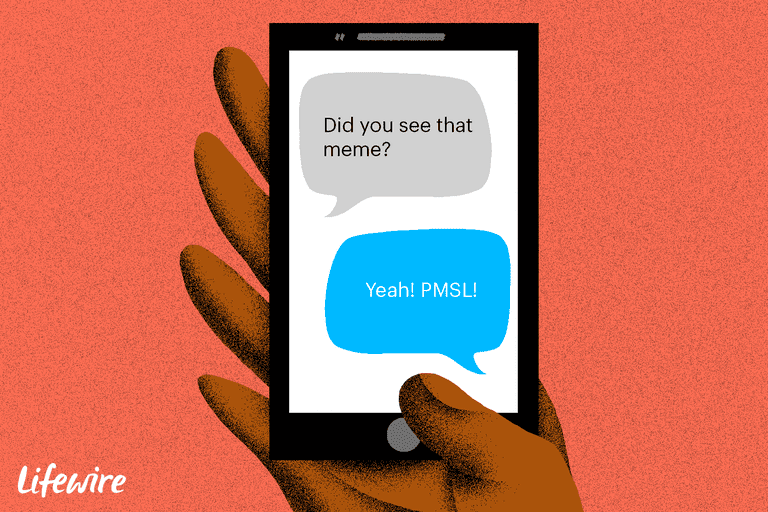 The PMSL expression, like many other online expressions and web lingo, is part of online conversation culture and is a way to build cultural identity through language and playful conversation. When using text message abbreviations and chat jargon, capitalization is a non-concern. You are welcome to use all uppercase (e.g. ROFL) or all lowercase (e.g. rofl), and the meaning is identical. Avoid typing entire sentences in uppercase, though, as that means shouting in online speak. Using good judgment and knowing who your audience is will help you choose how to use jargon in your messaging. If you know the people well, and it is a personal and informal communication, then absolutely use abbreviation jargon. On the flip side, if you are just starting a friendship or professional relationship with the other person, then it is a good idea to avoid abbreviations until you have developed a relationship rapport. If the messaging is in a professional context at work, with the management of your company, or with a customer or vendor outside your company, then avoid abbreviations altogether. Using full word spellings shows professionalism and courtesy.